South Kona Green Market in Captain Cook. The South Kona Green Market (SKGM) is located on a little bluff above and behind the Kealakekua Ranch Center in Captain Cook, at the third level behind Choice Mart and Ace Hardware on Mile Marker 109.5 of Mamalahoa Highway. Its motto, which the vendors take to heart, is “From The Land, By Our Hand,” and the market includes all local, farm produce, art, crafts, sustainability oriented items (LED lights, solar power systems, etc) – mostly all made by hand, as well as a wide variety of freshly prepared foods for eating at the market or for take-home. The market tries to keep a balance by not over-saturating any particular product, especially among the artists and crafters. The market was two years old this past August and some of the vendors who have been there from the beginning are the most passionate when speaking about it. The SKGM market is composed of about 78 individuals accounting for 35 vendors on any given Sunday. Although most of the vendors are from Kona and Ka’u, from time to time some come from all areas of the Big Island. Management has noticed an increase in local folks who come to just hang out for a few hours while munching on available foods and listening to the live entertainment. The best selling items are fresh greens, coffee, and general produce; paintings, prints and jewelry. Management would love to have someone selling carrots, celery, tomatoes and fish. They estimate that 75% of the farmers are either certified organic or use natural practices without petroleum-based fertilizers and pesticides. Live music is a regular feature every Sunday, and the area’s Master Gardeners make presentations once a month. Terrilee “Terri” Erickson of Kea Pua Iki. Kea Pua Iki (Little White Flower) owned by Terrilee “Terri” and Brian Erickson has been participating at this market since the market opened. The Ericksons have been farming since 1994 at their Kona farm at 1500 foot elevation where they practice organic (no chemicals) methods. They are working towards sustainability, growing mostly fruits and vegetables to make the jams and jellies Terri learned to make with her mother and grandmother as she was growing up. Terri’s products are a step above the norm, with a menu of flavors like Kona Coffee Jelly, Poha Roasted Poblano Jam, Hibiscus Jelly, Avocado Butter, Mango Habanero Jam and “Floral Jelly” which features lavender blooms. 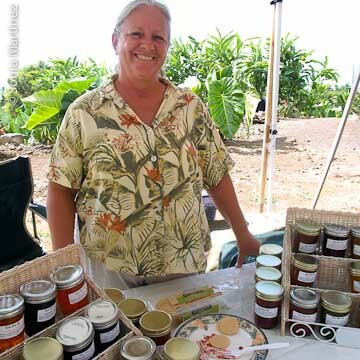 The day of our visit, just before Thanksgiving, Terri was offering samples of her delicious Ohelo Berry Macadamia Nut Jam Relish which could certainly take the place of cranberry relish on any well-served Thanksgiving or Christmas table. The best selling product is usually her Liliko’i Jam. Terri and Brian are working on getting a website up and running soon, so keep your eyes open for the Kea Pua Iki brand name. Karen Kriebl, creative development director, Luana Farm. 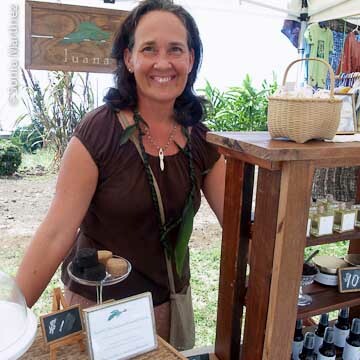 Also at their booth, Karen sells her own line of skin care products made exclusively with the fruits, vegetables and honey from their farm under the company name of Luana Naturals. The inspiration to develop good ‘food’ for the skin began three years ago. Karen uses avocadoes, tropical fruits, herbs and vegetables from their gardens…and yes, even some of that award-winning coffee ends up as “Hawaiian Wake-Up Coffee Scrub”. “For my skin care line, my ‘ili Oil is a favorite” Karen says “‘Ili means skin in Hawaiian. I blend avocado oil and kukui nut oil with the herbs chamomile, comfrey and calendula. It is light and perfect for cleansing, moisturizing, hair conditioning, or as a cuticle and body oil. “Beautiful skin begins with beautiful farms,” she says. Tim and Karen emphasize that they want to be able to leave the farm to the next generation in even better condition than they found it. Deb Olson of Tribal Grounds. 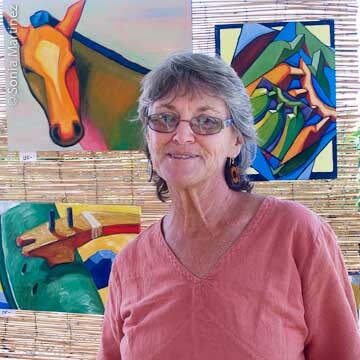 Deb Olson of Tribal Grounds has been in business in Honaunau, farming without chemical fertilizers and pesticides, for eight years, and has been a vendor at this market every Sunday since it was founded. Her farm is located at 800 foot elevation where she grows a variety of vegetables, nuts and fruits. The farm is solar powered and depends on low-input, large scale composting to build humus-rich soil. At her booth Deb sells whatever is in season from the farm: coffee, macadamia nuts, mangoes, bananas, avocadoes, papaya, limes, liliko’i and squash. Deb also bakes bread and cookies using whatever fruits and vegetables are available. On the day of our visit she was selling her own homemade trail mix composed of pumpkin seeds, macadamia nuts, sesame seeds and tamari. Covering her tables were pumpkin bread, rolls, pies and cookies, plus avocadoes, liliko’i, lemons and papayas. 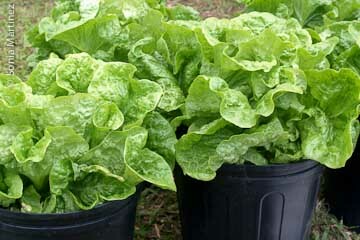 Fresh lettuce by Ke'ei Mauka Coffee Farms. The booth called Ke’ei Mauka Coffee Farms is owned by Chuck Gallison and his wife Nina Garcia. They have been selling for the last two years at this market under the name AKA The One Day Café. Their farm is situated mauka of Highway 11 between Mile Markers 107 and 108, just a couple of miles south of the market location. They have been in business for the last 20 years and recently expanded acreage and increased production. Located on an old macadamia nut orchard that had been bulldozed and abandoned for many years, much of the farm was helped along for many years with falling leaves and nuts naturally composting themselves and creating soil full of nutrients and organic matter. The other part of the farm is rock and lava -- but by practicing above ground farming techniques using raised beds and planting containers, and then adding manure from their own chickens, that’s where they now grow almost all of their vegetables. Chuck and Nina sell roasted and green coffee beans as their main crop but also have free range eggs, lettuce, bell peppers, green beans, snow peas, cucumbers, chard, green onions, and beets, depending on the time of year. They are expanding their raised beds to include a larger variety of vegetables and will be marketing hearts of palm once their palms are old enough. A unique feature of this booth is that Chuck brings lettuce to the market planted in gallon pots. He does not cut the lettuce from the roots until you buy it. You can’t get any fresher than that! We were invited to participate in market vendors’ pot-luck Thanksgiving meal after the market closed, but we had a long drive home and regretfully declined.